High-Heeled Boys: Part of an era passed with Jim Capaldi, far left. Billings, Mont., 1968. Four casually elegant musicians and a small circular glyph peeked out from a supermarket discount rack, a wordless album cover that somehow spoke volumes. The back revealed that this was, indeed, Traffic, a obscure British band whose praises I must have encountered earlier in some stray scrap of countercultural flotsam. Reason enough to part with a few bucks and check 'em out. More than half a lifetime later, it remains one of my all-time favorites. That was my introduction to Traffic, the remarkably inventive band voted into the Rock and Roll Hall of Fame last year, but who came to their undeniable end on Jan. 28 with the death at age 60 of founding drummer Jim Capaldi from stomach cancer. Steve Winwood, whose distinctive voice and forceful organ playing had led the Spencer Davis Group to British Invasion stardom while he was just a teenager, remains the best-known Traffic member, but Capaldi was the hub around whom the new group coalesced. Guitarist Dave Mason, a transplanted American, was a school chum, and woodwind ace Chris Wood was recruited from the Manchester-area band Locomotive. The foursome legendarily sequestered themselves in a cottage in the Berkshires, emerging several months later with their first single, "Paper Sun," in May of 1967. It was a huge hit in Britain but was barely noticed stateside. "Hole in My Shoe," a whimsical slice of pop psychedelia written by Mason, followed up the British charts, as did a third single, "Here We Go 'Round the Mulberry Bush." But none of these singles were included on the band's first album, Mr. Fantasy, at least in its original British configuration. An American version eventually arrived, with the first two hits prominently featured and other Mason tracks dropped, along with most mentions of him, as he had left the band for a time. Stranded on a label with little idea how to market them (UA's biggest acts at the time were Bobby Goldsboro and Gordon Lightfoot), Traffic made inroads with U.S. tastemakers, though their debut was not widely heard. But the second album could not be denied. With Mason back on board, Traffic was and is a landmark collection of memorable melodies, shifting textures, dreamy images and supremely confident performances. "Feelin' Alright," a hit for Joe Cocker, became Traffic's most widely covered song, thanks in considerable part to its relative simplicity. 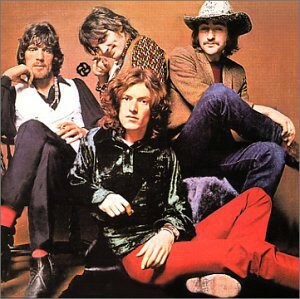 Moodier fare such as "Forty Thousand Headmen" and "No Time to Live" set Winwood's keening vocals against spare, evocative tracks that blended folk, jazz and even classical elements into something unmistakably original. In a personal favorite, Mason begins "Cryin' to Be Heard" crooning gently over a soft acoustic guitar bed, dusted by Wood's breathy flute (a vocal counterpoint joins in on later verses). Then Winwood's Hammond organ boldly sweeps in to claim the chorus, as his clarion vocal drives the song to a passionate peak with Wood's soprano sax wailing atop the crest, which subsides and then rises again, as the lyric darkens from sympathy to self-doubt. All in a little over five minutes. But that pinnacle was never reached again. Mason left again for good and only two of the subsequent nine Traffic albums came close to the standards set by the first pair: the largely acoustic John Barleycorn Must Die (1974) drew new inspiration from traditional British folk songs, while The Low Spark of High Heeled Boys was carried by a looser rhythmic sound and a good-time rock and roll feel. Along the way--perhaps inspired by contemporaries such as Cream--Winwood, Capaldi and Wood, plus others, used live dates to explore the seminal jam-band ethic, efforts that are documented on three different recordings, but which don't offer the listener much payoff. Even as a great admirer of the band, I recall their live shows from the mid-1970s as overlong and underinspired. Mason, meanwhile, never found another creative foil. Despite one excellent solo album (Alone Together), some appealing work with Delaney and Bonnie Bramlett and a handful of strong songs, he drifted into soft rock mediocrity, even at one point cutting a mismatched duo disc with Mama Cass Elliot. Chris Wood drifted along as a session man, dying at age 39 from pneumonia while Winwood, of course, has enjoyed a highly successful solo career, albeit with just enough of an edge to keep him from disappearing into the aural sinkhole of KZST play lists. But the early Traffic albums endure as epitomes of the boundless explorations that characterized their time, music whose energy, invention and imagination remains fresh and deeply satisfying even now.